Nobody’s letting Han Solo’s co-pilot win in the first issue of his new comic book series. Chewbacca attains victory all by his own furry self. That sardonic recap of the events of Episode IV homes in on the reasons that generations of fans have loved Chewbacca. He’s a big, hairy paradox: a feral, death-dealing warrior who’s the source of much of the humor to be found in the Star Wars movies. Chewie is a character that other players react to. Most of his friends and enemies don’t know what he’s saying. But their confusion, amusement or surprise at his growls are how the audience learns about the big heart underneath the bandolier full of ammo. 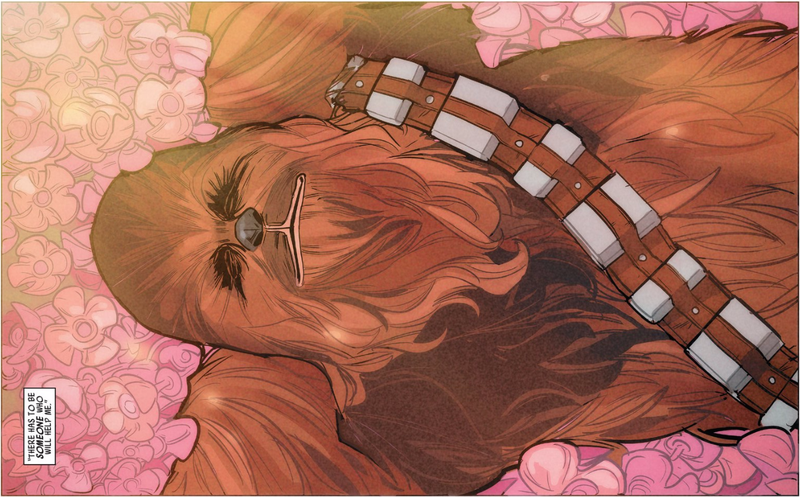 Written by Gerry Duggan with art by Phil Noto, this solo adventure finds everybody’s favorite Wookiee stranded on a remote planet called Andelm-4 after his ship crashes there. Chewie isn’t too stressed about being unable to get off-planet, though. but Zarro makes an imperfect escape from the indentured servitude, only to face the enormity of trying to find justice for her dad. Many years ago, film lovers, critics and scholars noted how influences from the work of Japanese director Akira Kurosawa showed up in George Lucas’ Star Wars films. Chewbacca #1 taps directly into that connection. With the way he stumbles into a small community’s exploitation by an outside force, the Millennium Falcon’s co-pilot may as well be one of the title characters from The Seven Samurai. His initial reluctance to help feels like a nod at that classic movie, too, and also falls in line with the the big, broad plot beats found in postwar movie Westerns. Duggan’s sure-handed scripting strikes a nice balance between goofy humor and heartfelt emotion. Things move along at a decent clip but all of the important moments have space to breathe and resonate. Noto has long been one of mainstream comics’ best stylists, adored for his sleek linework and slick design sense. The creations that come off his drafting board are suffused with a cool smoothness that makes them feel effortless and unattainable. So it’s a welcome surprise to see how well he creates an air of shaggy, messy affability for Kashyyyk’s most important export. A young kid pleading with a mysterious, potentially dangerous stranger for help, outside forces draining a powerless community of its will to resist, a hero more at home in a town’s seedy underbelly.... these filmic homages don’t just connect this comic book to the medium where Star Wars began; they also point out the idea that Chewbacca is essentially a silent film character in a world full of chatty, expressive dramatis personae. His communications can be loud but also lean on subtlety. Peter Mayhew’s performances under Chewie’s trademark make-up accomplished much with a simple tilt of the head or shrug of the shoulders. Chewbacca is the character that we’re not meant to comprehend. So it’s ironic that his comic’s first issue speaks so eloquently about the cinematic DNA that’s made Star Wars so appealing throughout the years.